Hospitals are supposed to be a place where patients go to heal and recover. People go to hospitals when they are sick or in need of medical attention from highly trained professionals. Unfortunately, over 100,000 people die every day across the United States due to medical mistakes. Every day, patients across New Jersey entrust doctors, nurses, and medical staff with their safety and security. They choose medical professionals who provide quality treatments that satisfy the accepted standard of care. Unfortunately, there are instances where people suffer preventable harm during medical procedures, and when medical errors occur, they can result in catastrophic injuries or wrongful death. These individuals are often left with numerous questions that are rarely answered. If you are wondering who is responsible for your injury and what you can do to make sure it does not happen to someone else, you should contact the law offices of Brady, Brady & Reilly, LLC as soon as possible to discuss your situation and find out if you have the right to pursue legal action. Our team of experienced attorneys can help you uncover the truth, pursue medical compensation, and grant justice to which you are entitled for your injuries and damages. Medical malpractice is a term often applied to situations where individuals file claims against medical professionals, wherein the professionals’ actions or inactions deviated from the acceptable standards of medical care. When doctors and other medical professionals do not provide adequate care to patients, patients can become seriously injured. Individuals seek medical care to get better, but unfortunately, there are far too many instances where patients’ conditions do not improve and, instead, they are left with more complicated conditions and injuries than before. These situations often deeply frustrate victims who endure the negative side effects of negligence by medical professionals. When filing a medical malpractice case, it is imperative for victims to demonstrate the accepted standard of medical care. Furthermore, patients will have to demonstrate how the medical professional who caused their injuries deviated from the acceptable standards. Successful medical malpractice lawsuits hold doctors, surgeons, nurses, and other healthcare providers accountable for their carelessness and wrongdoing. The intentions of medical malpractice lawsuits are to provide a way for victims to help alleviate some of the financial burdens they experience in the aftermath of their incidents. Additionally, medical malpractice cases hold at-fault providers responsible for their actions, with the goal of ensuring other patients do not fall victims in the future. Working with an experienced and respected attorney from Brady, Brady & Reilly, LLC will ensure you obtain the full and fair amount of compensation for which you are entitled to for your case. 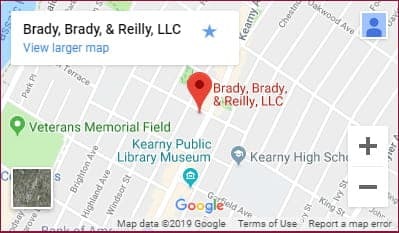 Since 1965, the lawyers at Brady, Brady & Reilly, LLC have helped accident victims throughout Essex County, Hudson County, and North Jersey obtain the maximum amount of compensation they deserve for their injuries and damages related to medical malpractice. Our attorneys work aggressively and effectively to help victims of medical malpractice. Our extensive knowledge and skills help victims handle even the most complex cases involving a broad range of malpractice-related injuries. Informed consent: Patients who are misled or not fully informed about the circumstances surrounding surgeries or procedures often sustain unexpected results. Patients provide consent for one surgery and sometimes wake up missing organs and body parts against their knowledge. In these circumstances, victims can suffer serious health complications. Post-operative infections: While under the care of medical professionals, patients rely on nurses and doctors to provide care after surgery. In these situations, they are often charged with changing bandages, ensuring property drainage occurs, and providing routine care for wounds. When medical professionals are negligent, it can lead to the development of infections which can be serious and life-threatening to patients, especially individuals with compromised immune systems. Anesthesia malpractice: When an anesthesiologist or nurse anesthetist is negligent and makes mistakes during surgeries, patients are at risk of suffering extreme pain, causing individuals to develop posttraumatic stress disorder, brain damage, other devastating injuries, and sometimes, even death. Birth injury: If doctors and nurses do not exercise the proper standards of medical care during delivery, children may be born with devastating birth defects. Some of the most common birth injury claims include cerebral palsy, Erb’s palsy, brachial plexus injury, nerve injury caused by forceps, spinal cord injuries from overstretching, and meconium aspiration syndrome. Cancer misdiagnosis: When doctors fail to diagnose cancer or misdiagnose the symptoms as another condition, patients are deprived of critical medical treatment. Not only can treating the wrong disease be harmful, but, unfortunately, there are cases where patients’ cancers become untreatable due to not being tended to and metastasizing. Failure to order diagnostic testing or make referrals to oncologists could delay diagnosis by months or years, which can be life-threatening. Cerebral palsy: Babies could suffer from brain injuries that result from the failure of doctors, hospitals, and nurses to follow proper standards of medical care during delivery, leading to Cerebral palsy. Unfortunately, this devastating condition often leads to severe physical and/or mental impairments, as well as extreme medical expenses for families. Erb’s palsy: This birth injury typically occurs when the baby’s shoulder becomes stuck on the mother’s pelvic bone during childbirth, causing babies to suffer permanent nerve damage which can severely limit their ability to use their arm for their entire life. Failure to diagnose or misdiagnosis: Misdiagnosis is one of the most common medical mistakes in New Jersey. This failure occurs when doctors do not recognize medical conditions adequately. Patients who have symptoms or warning signs often require immediate medical attention. Delaying diagnosis or diagnosing the wrong medical condition can prevent a patient from receiving adequate medical care, and by the time proper treatment is determined, it can often be too late. Hospital malpractice: Patients often seek immediate medical attention during times of emergency. Unfortunately, the quality of care they receive often plays a critical role in whether or not a patient is able to overcome their injuries or illness. Hospitals that provide inadequate care to patients can cause further injuries or death to occur. Medical negligence: Physicians are often entrusted with analyzing and properly treating patients. Unfortunately, split-second decisions can be the difference between a patient’s success and devastation. If medical providers fail to give their full time and attention to a patient, or they are otherwise negligent in their actions, they should be held liable for any resulting injuries or death. Nursing home negligence or abuse: Entrusting a team of care providers to look after to your loved ones can be overwhelming and terrifying. Unfortunately, there are instances where elderly and sick patients are abused or neglected by staff in nursing homes. When these instances result in injury or death, victims or their surviving family members can file lawsuits against the care provider to obtain compensation and justice. Plastic surgery malpractice: Cosmetic surgery is extremely complex. These procedures often carry substantial risks of complications, especially if surgeons are not properly trained or they fail to follow appropriate standards of medical care. Mistakes during plastic surgery can result in disfigurement, permanent physical injuries, or death. These injuries often have a serious impact on patients’ mental health as well. Prescription errors: Every year, millions of injuries and death result from prescription errors and medication mistakes. These injuries are often avoidable, especially in instances where doctors prescribe medications to patients incorrectly, the pharmacy fills the wrong dosage, or nurses dispense the wrong medications to patients. No matter what type of medical malpractice injury you sustain, Brady, Brady & Reilly, LLC will help you fight for the justice and the compensation you deserve. Working with our knowledgeable experienced team of attorneys will ensure you are able to receive the highest-value outcome possible for your case. Compared to other personal injury claims in New Jersey, medical malpractice cases are fairly complicated. There are various legal issues and medical evidence surrounding these cases that can get very complicated very quickly. Individuals who are considering filing a medical malpractice lawsuit have two years to file after the injury occurred. There are no limitations in New Jersey on the amount of compensatory damages victims can obtain for a medical malpractice claim. In the state of New Jersey, the only cap in place covers punitive damages, which are limited to $350,000 or five times the amount of compensatory damages, whichever is greater. Compensatory damages can be awarded in total to patients for their experience. Pain and Suffering: Individuals who sustain injuries in medical malpractice cases are able to receive compensation for their pain and suffering. Quite often, these cases result in further injuries, complicated recovery processes, and unnecessary pain and suffering. Victims sometimes are left struggling with their new injuries indefinitely. In these cases, victims are compensated based on the severity of injuries and the impact for which they have on their lives. Mental Anguish: Suffering a medical malpractice injury can cause patients to experience extreme distress and anxiety. In some cases, victims are forced to undergo counseling and receive medication and other treatment for mental health conditions related to their traumatic experiences. In certain cases, victims can receive compensation for the mental side effects they experience from their injuries. Lost Wages: Individuals who have to go through longer recovery periods, miss work for treatments, or go through further hospitalization may be able to still be paid for lost wages. This is especially true in cases where injuries result in severe impairment to patients or their young children. Medical Expenses: Medical expense reimbursement is available for victims of medical malpractice related to their injuries. Victims who sustain further injuries due to medical malpractice often face long roads of further medical care and treatment. Victims are able to attain repayment to alleviate all of the medical expenses related to their injuries and conditions. Loss Of Consortium: When victims are injured due to medical malpractice, the negative side effects often spread to their spouses and children. In certain cases, victims are able to obtain compensation for loss of consortium. Judges often take into consideration the impact for which injuries have on a victim’s ability to enjoy spousal relationships and other enjoyable activities. If you or someone that you love has suffered a medical malpractice injury, or your loved one died due to medical malpractice, it is crucial to contact an experienced attorney as soon as possible. Working with a knowledgeable and reputable attorney from Brady, Brady & Reilly, LLC will ensure you obtain the maximum settlement for your injuries and damages. We take great pride in providing our clients with the level of care and attention they expect and deserve. We have the experience and the knowledge to appropriately advise you and advocate for you after a medical error or negligence has occurred. We listen to our clients and take their thoughts and opinions into consideration every step of the way while protecting their legal rights on their behalf. We explain the process in layman terms so that our clients fully understand all of their legal options. Our goal is to alleviate the legal burdens from patients so they can focus on their recovery. Our team of well respected and experienced attorneys works diligently to help injured victims get justice. We provide each client aggressive, yet compassionate, representation that helps them achieve the outcomes they expect for their cases. With over 50-years of experience in the courtroom and at the negotiation table, we have mastered our skills and dedication to helping clients get the justice and compensation they deserve for their tragic experiences. Our determination has ensured we are able to handle even the most complex medical malpractices cases in New Jersey and have obtained high value settlements for the injuries they suffered at the hands of a medical professional and we can help you too. Contact our law office today to speak with a skilled lawyer about your medical malpractice experience to find out if you have the right to pursue legal action against the responsible parties. We work on a contingency basis so you won’t pay a penny for our services until your case has been won or settled. Call us today to schedule your free consultation at (201) 997-0030.